If we focus on earthly realities, we can easily become discouraged. Just turn on the evening news and before long, you will get your fill of bad news. Wars, hardships, sickness and the consequences of a greedy orphan world dominate the news. Add to that, the pressures of work, finances, relationships, and so much more, and feelings of being overwhelmed can soon follow. Jesus told His disciples that in the world, they would have trouble (John 16:33) but they could still have peace in the midst of it all because He had overcome the world. Considering all of his disciples were martyred (except John), the overcoming that Jesus promised had to be something of far greater significance than their own creature comforts. He was giving them a glimpse of the BIG picture. A picture so vast that the human mind couldn't comprehend it. (1 Corinthians‬ ‭2‬:‭9-10) A picture so beautiful that nothing on earth could adequately compare to it (John 14:1-3) A picture so intense that the expanse of the universe couldn't contain it (Psalm 103:11). Something so ferocious, that nothing could ever separate us from it (Romans 8:35-39). He was opening up their hearts up to the love (John 16:25-27) of His Dad. You see, eternity is not a limitless measure of time, but an intimate relationship with the One who is eternity itself (John 17:3). We read in Romans 8:38 that the Apostle Paul needed to be convinced of this life-altering truth, but once he was persuaded, his perspective changed! All of a sudden, being stoned, nearly beaten to death, shipwrecked, rejected, judged, persecuted, imprisoned and eventually beheaded were considered merely 'light and momentary troubles compared to the eternal glory that would be revealed'. It was only when Paul got a glimpse of the glory of God's love that he could see himself as 'more than a conqueror' because of it (Romans 8:37). That my friends, is truly the big picture. We are loved through thick and thin. Through good days and bad days. Yesterday, today and forever! When we know that we are loved with an everlasting love (Jeremiah 31:3), we need no longer go through the emotional roller coaster ride of life, pulling out 'He loves me, He loves me not' flower petals depending on the good and the bad that we experience in life. I'm not saying that life becomes easy because that is simply not the truth. Life can at times be hard, unfair and heart wrenching. But the more that we know that God is close to the brokenhearted (Psalm 34:18), we can be comforted in knowing that we are not walking through this life alone (2 Corinthians 1:3-5) because we are loved in every circumstance. When we begin to realize that our Heavenly Papa has always loved us and He will always love us, we can take a deep breath, relax and let Him carry us through whatever comes our way (Isaiah 46:3-4). The big picture to Jesus was that His Father loved Him before the creation of the world (John 17:24) and His heart's desire was and is that we would know that same love too! So my prayer is that we would be more convinced today that our Papa has loved us from before the creation of the world (just like Jesus) and He chose us way back then to be part of His eternal family (Ephesians 1:3-6). I pray that no matter what life throws at us, we will know that the One who is Love personified (1 John 4:16) has committed all of the resources of heaven to strengthen, comfort and encourage us (1 Corinthians 14:3) every step of the way. As our friend Jack Winter used to say when referring to Jeremiah 31:3 - (I have loved you with an everlasting love)... "There has never been a time in all of eternity when you were not loved". May the revelation of this simple but life-altering truth become more of a reality today than yesterday. 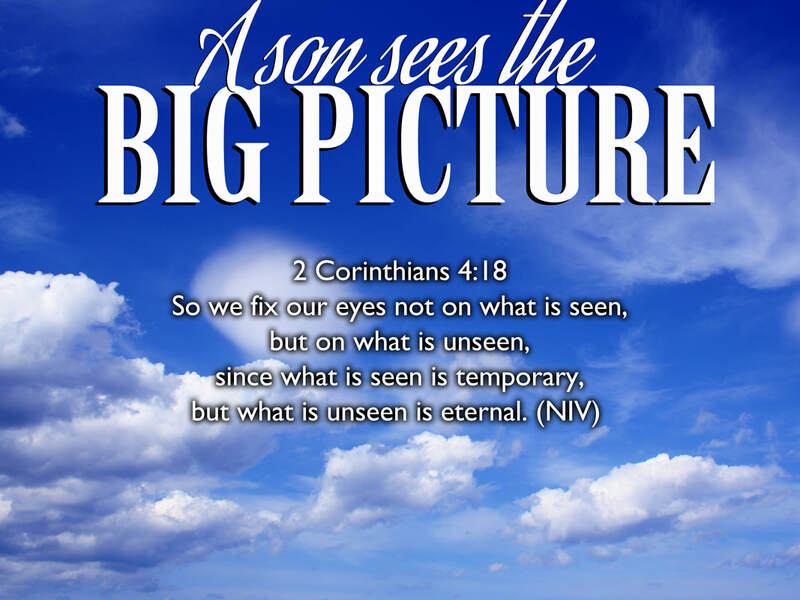 And with each passing day, may we all be able to fix our eyes more firmly on the unseen and the eternal, so that we can gain heaven's perspective on our lives. Being fully persuaded that, nothing (and I mean NOTHING) in all creation can ever separate us from our Papa's love in our Elder Brother, Jesus Christ. As long as we keep looking at the big picture, we will be assured that everything will work out for our good in the end (Romans 8:28).